Sahara Force India returned to the points this afternoon as Paul Di Resta finished the Korean Grand Prix in tenth place. 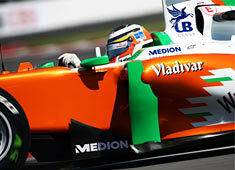 Teammate Adrian Sutil finished just behind in eleventh place. After a difficult race it was probably the best they could get out of Korea.